Plants or sets? Completely your choice. Plants have the green tops and sets don’t so be sure you put the root end down if you choose sets. You’ll want a sunny, well draining bed. Onions do not compete well with weeds and they will go soggy and rot in poor draining soil. You must stay on top of weeding to prevent stunted growth. Whether or not to rotate your bed annually is a matter of some debate, dependent mostly on your willingness to go above and beyond in killing any potential bacteria after harvest. However, if you are starting a new bed, it is unwise to plant anywhere onions were grown in the previous three years as you do not know what may be in the soil. Onions prefer a pH around 6.5 to 7, however the common varieties are very tolerant if you don’t know how to test your soil. Amending your soil generously with composted manure will make the nitrogen loving plants happy. 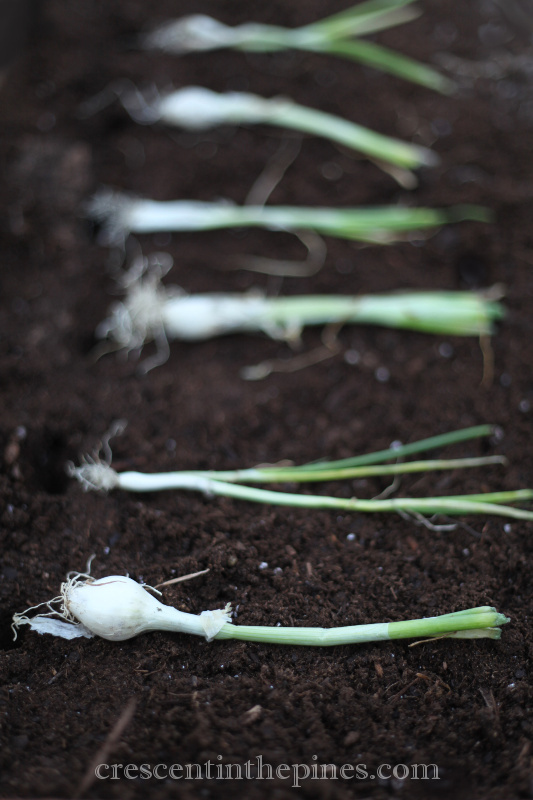 After amending your soil, I suggest giving it a week or so to settle, or if you are planting immediately pack the soil firmly down as onions prefer firm soil. 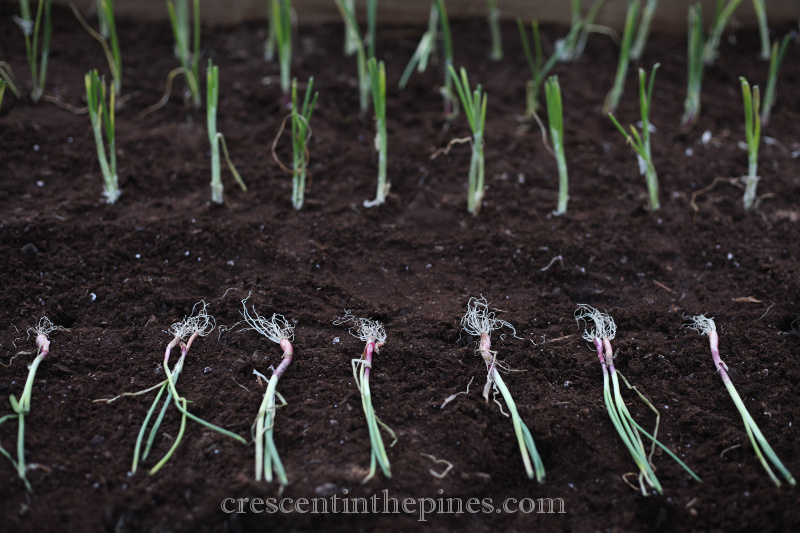 Onions are very frost tolerant and do best when planted while the days are still cool. For the ideal planting time for your region, the Farmer’s Almanac provides an excellent guide, or feel free to message me for timing tips. Before planting, be sure to water the bed not to the point of sogginess but to an even light moistness. Onions do better planted in lightly damp soil than in dry. Not space takers, depending on the size of the variety they can be planted in rows about 9”-12” apart and about 6” apart from each other in their rows. Planting them about 3” apart initially allows you to pull green onions throughout the spring until the final harvest plants are the preferred 4-6” apart. * I like to lay my plants out where they will be planted after sorting out the unusable plants. It speeds up the planting process and allows you to get a visual of the final layout before planting begins. To plant, shove your finger into the dirt about an inch and place the onion in then gently firm the dirt around it, just enough to fill the hole and stabilize the onion. This part is remarkably fun for your little garden helpers. Water lightly after planting and continue to do so daily for a few days until the sets start to show green tops or the plants green tops grow noticeably. After that, taper off watering to every other day depending on heat and rainfall in your area. Onions will not tolerate constant dampness.